Tess Gerritsen wasn’t drawn to write gory thrillers because she had a peculiar lust for blood and violence. Instead, her path to murder was an immigrant’s tale. It began with Gerritsen’s mother, a native of China, who didn’t understand English well. But she could easily grasp the universal language of film, particularly horror movies. “She dragged my brother and me to the theater. 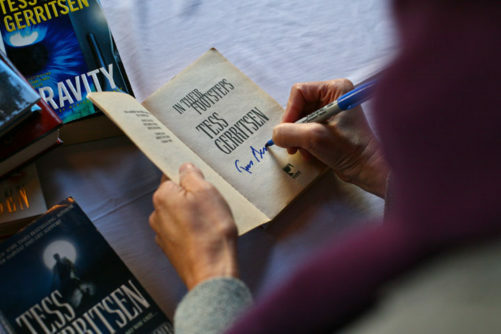 We screamed our way through childhood,” Gerritsen told a National Writers Series audience of nearly 300. Gerritsen confided she learned early on how to frighten her reading audience. Interviewed by Traverse City’s own Kerrey Woughter, Gerritsen delighted the NWS audience with her humor and brilliant intellect. She has written 15 thrillers and suspense novels since leaving the medical field. Many of those novels are informed with her medical knowledge gained as a physician. Her career path to a New York Times bestselling author was obviously not a direct one. As the child of Asian immigrants, she says her father favored job security over the studying the arts. Success was important. She wryly told the audience that her brother is an anesthesiologist. “He wanted me to go into sciences, so I went into medicine,” said Gerritsen, who graduated from Stanford University and earned her M.D. at the University of California. She fell in love with romance novels after a co-worker gifted her a bag of romance novels, which she found helped ease her job stress. While on a three-month maternity leave, she decided to attempt writing a romance novel of her own. Gerritsen decided then her doctor days were over. That was a record for the discomfited Harlequin staff, but they published the novel anyway, Gerritsen said. Gerritsen didn’t find the jump from romantic suspense novels to thrillers all that difficult. “Murder and romance are pretty similar,” she told the NWS audience. Her medical thriller Harvest debuted in 1996. Gerritsen went on to publish Life Support, Gravity, Vanish, The Surgeon, and The Bone Garden. Her books have been published in 40 countries and more than 30 million copies have been sold worldwide. But Gerritsen is subtle with her gore. She prefers not to show the knife piercing the chest or the bullet penetrating the skull. Instead, the readers unravel the dark actions through the eyes of the medical examiner and her best friend, a police investigation (their strong friendship inspired the TNT television series Rizzoli & Isles). “There’s distance between the reader and the crime, which makes it palatable,” she said. Still, Gerritsen’s stories are abnormal, and her murderers more sinister than most. She talked about writing a novel that involved a murder victim arriving at a hospital. The victim wakes up in a body bag, murders a doctor, and takes hostages. While musing about the plot on a drive, she realized that putting a woman in the body bag would be culturally more potent than placing a man there. “From that point on, it was always a woman in the body bag,” Gerritsen said. “She looked totally normal,” said Gerritsen. “It turns out she was a third-grade teacher.” The fan’s request came alive in The Surgeon. Faithful readers curious about what gore might pop up in her next book can find a section on “creepy biological facts” on Gerritsen’s website. The posts include “top ten creepy ways to die”, human sacrifice and cannibalism. You can also read about her legal action on her blog against Warner Bros., New Line, and Katja regarding her novel Gravity and the movie by the same name. The similarities between the two, Gerritsen said, were no coincidence. Gerritsen, who lives with her family on the coast of Maine, told the Traverse City audience that she’ll never return to medicine, but that her knowledge of medicine does inform her writing. She has taught writing workshops to physicians, she said. “Writing fiction really influences people’s emotions, and that could help doctors,” she answered. Doctors looking to write should avoid overly technical or medical language.